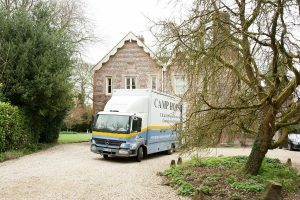 Are you moving house and needing removals in Andover? Then you’ve come to the right place. We’ve been doing them for seventy years, getting better and better all the time. We know the area extremely well and we’ll plot a route from A to B to get you there in good time, ready to enjoy your new living space. Whether it’s a large house move or a studio, we’ve got the people and the equipment to get it done and done right. We know it’s a stressful time for you, so we do everything we can to alleviate the worries and turn it into a time of optimism and fun. You may not have thought it was possible to enjoy moving, but we’ll show you that it is, and we’ll do it at competitive rates, too. Not all removal companies in Andover take the trouble to care, but we do every time and that’s one of the things that make us different. Our fully-trained, quick-thinking movers, drivers and packers are ready. All you need to do is call us and we’ll send out an estimator who’ll prepare you a quotation. Than it’s all systems go, as soon as you give us the word. We can help with all the packing and unpacking and do all the heavy lifting so that you can get settled from day one and relax in your new environment. Our packers are well-versed in how to handle fragile and irreplaceable possessions and will take all the care they’d extend to their own property to yours. Our movers make sure they don’t damage paintwork or banisters or carpet as they lift furniture and take it out of the front door, storing it safely on the moving vehicles. Storage in Andover is easy, thanks to our first-rate facilities that can take care of you, no matter your specific requirements. If you need it long-term, we’ve got it – and the same goes for short-term. Everything will be carefully categorised and we’ll provide a detailed inventory to you. When you need anything back, it can be delivered right to your front door. We’re hard-pressed to think of any service in Andover that can give you what Camp Hopson can. Call us today to find out more.